The paper identifies the characteristics of firm activities that constitute its technology scanning dynamic capability, which enables the firm to translate information about customer needs into information about tangible ways to introduce new products and services to satisfy those needs. The ability to find a specific actionable way to address customer needs is proposed to be measured by a latent construct called technology scanning. 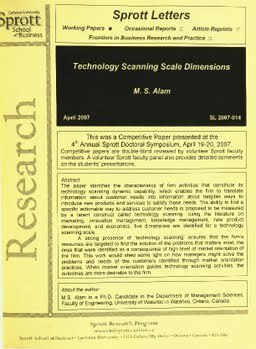 Using the literature on marketing, innovation management, knowledge management, new product development, and economics, five dimensions are identified for a technology scanning scale. A strong presence of 'technology scanning' ensures that the firm's resources are targeted to find the solution of the problems that matters most, the ones that were identified as a consequence of high level of market orientation of the firm. This work would shed some light on how managers might solve the problems and needs of the customers identified through market orientation practices. When market orientation guides technology scanning activities, the outcomes are more desirable to the firm. Alam, M. S. (2007). Technology Scanning Scale Dimensions. Sprott Letters, April(2007).